The collection includes a number of allegorical "roadmaps" intended to encourage the viewer to act in conformity with religious norms. See Subjects > Heaven and Hell. This map comes from "The Pilgrim's Progress," a religious allegory by an English preacher, John Bunyan. It was first published in 1678 and has often been called the most read book in the English language but for the Bible. "The protagonist, named Christian, faces temptations and digressions that could prevent him from reaching his goal, God’s celestial city. The symbolic nature of the work lends itself to graphic illustration: the Slough of Despond, the Valley of the Shadow of Death, Vanity Fair—such 'obstacles' have become iconic in Western literature. The universal resonance of Bunyan’s work—it has been translated into more than two hundred languages—accounts for its never having been out of print." Delaney 2012, 201. Bunyan was not ordained by the Church of England and refused to use the Book of Common Prayer; "The Pilgrim's Progress" was likely begun while he was imprisoned for refusing to stop preaching. 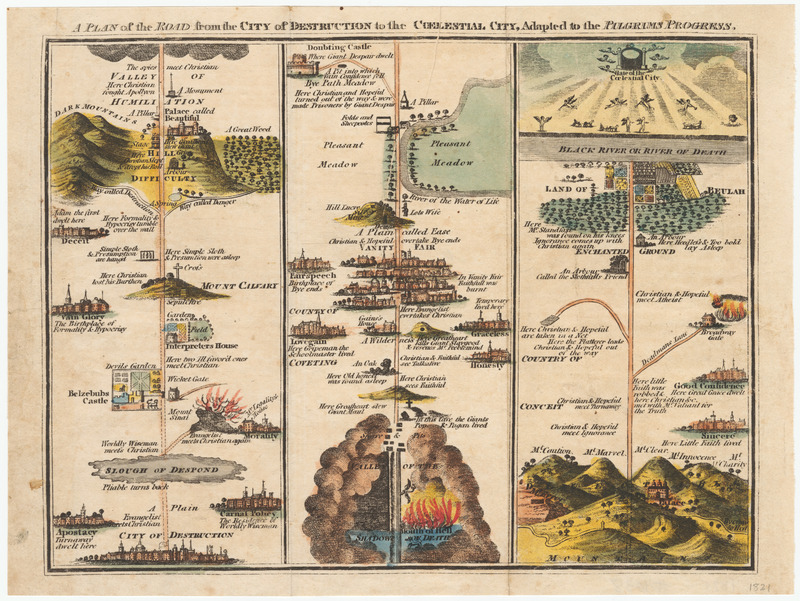 A number of editions of The Pilgrim's Progress contain a version of the "Plan of the Road from the City of Destruction to the Celestial City." In most cases, the road is displayed in three vertical segments, as here. For a version displaying the road as a spiral, see ID # 1055. Interestingly, several scholars have suggested a correspondence between the topography and structures described in "The Pilgrim's Progress" and those Bunyan might have seen on his own journeys from Bedford to London; these are collected at http://en.wikipedia.org/wiki/The_Pilgrim%27s_Progress#Places_in_The_Pilgrim.27s_Progress, accessed December 6, 2014. Bunyan, John. 1821. The Pilgrim’s Progress from This World to That Which Is to Come: Delivered Under the Similitude of a Dream, Wherein Is Discovered the Manner of His Setting Out, His Dangerous Journey, and Safe Arrival at the Desired Country.